Imperial Dawn confirmed she is filly of real potential with an exciting win at Pakenham on Thursday night. 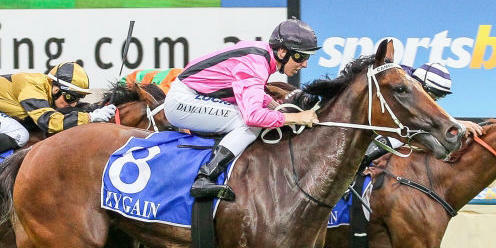 Racing for just the second time, the three-year-old showed the benefit of the experience of her luckless debut with a powerful finish under Damian Lane to get up late to win the Fillies and Mares Maiden (1400m). “We’ve been patient with her but she is shaping as though she has a decent future,” Scott Cameron said. Imperial Dawn was a $50,000 yearling purchase by Russell Cameron Racing at the 2017 Melbourne Premier Sale and is now shaping as a most astute purchase. By High Chaparral, Imperial Dawn is a half-sister to Group winner Miss Rose de Lago and Cameron said it was with a future in mind he purchased the filly. “She has a terrific pedigree,” Cameron said. “She was a bit immature s a yearling which is not what the market wants so we were extremely pleased to be able to buy her. “We knew she would need a bit of time and that’s how it has worked out. We’re lucky we have such a great group of owners who have been patient.